BOB ABERNETHY, anchor: We have a report today from one of the neediest countries on earth — Haiti in the Caribbean. Church and other relief groups and heroic aid workers are helping, but Haiti’s plight remains daunting at best. First came the devastating Hurricane Jeanne four years ago. Then this year Hurricanes Fay, Gustav, Hanna, and Ike all battered Haiti’s north coast. Fred de Sam Lazaro visited the city of Gonaives, with its desperate people and everywhere — mud. FRED DE SAM LAZARO: When the food supplies arrive in Gonaives, so do riot police from the UN peacekeeping mission to Haiti. They bring some order but not food for everyone. A stream of needy people, mostly women, leaves empty-handed. UNIDENTIFIED WOMAN (through translator): I’m dying of hunger and so are my kids. I came here to get food, but they’ve given it all away. I haven’t eaten anything today. I’m still hungry. DE SAM LAZARO: A number of church-based groups have tried to fill the gaps, showing up at camps for the displaced with a cooked meal, the efforts often piecemeal. 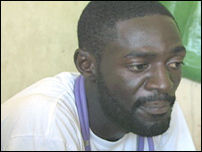 ISAAC ESTIME (Pastor, through translator): We provided food three times: last week, yesterday, today. Basically we need money to rebuild our church. Lot of kids who lost homes, parents, need money to take care of them. DE SAM LAZARO: At least 300 people lost their lives in this year’s storms. Perhaps 800,000, a tenth of Haiti’s population, lost livelihoods. 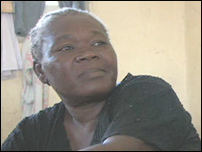 ODETTE JAME (Seamstress, through translator): I lost chairs, cooking pots, kids’ clothing. But the only thing I really cared about was my sewing machine, and I had a lot of material to sew for school uniforms. I lost all that, too. The money that I would have made from selling uniforms I would have used to send my kids to school. 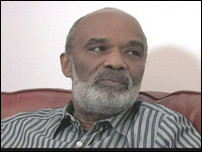 President RENE PREVAL (through translator): Just in Gonaives, we have three million cubic meters of mud. You can imagine the effort that is needed. I hope the international community understands the profound catastrophe Haiti is going through. DE SAM LAZARO: Haiti’s president, Rene Preval, has had to rely on the international community to lead the relief operation in a country where 80 percent live in what the UN calls absolute poverty, crippled for years by political and economic meltdown. One key non- government group has been Doctors Without Borders. At a temporary shelter, about 120 anxious mothers with infants and a few elderly sought their first medical attention since the hurricanes. Two-year-old Kelly was triaged to the top of the line with swollen face and limbs and aggressive skin rashes. Dr. LOUIS-JACQUES ISMAEL (Doctors Without Borders, through translator): The little child that you saw is malnourished, and one of the symptoms of that malnourishment is that you have dermatitis that rises up on the skin, and this is what we are seeing very, very often now. DE SAM LAZARO: Kelly’s mother received medicines and a nutrient-rich formula given to malnourished children. 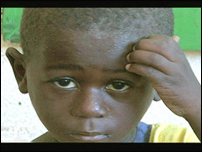 In Haiti, even before the hurricanes a quarter of all children were chronically malnourished. The key to Kelly’s recovery will also be access to food and clean water, something unavailable to half the population in the best of times. Deforestation over two centuries – for lumber and cooking fuel – is almost total now. It has eroded the soil, washing it into rivers and streams. Floodwaters from the hurricanes have contaminated wells, and Gonaives’ water pipe network, shaky before, is useless. Dr. RIGUELLE GILLES (Doctors Without Borders): We lost 80 percent of the water from the reservoir every day, which is way too much. DE SAM LAZARO: Just so I understand it, you’re saying that by the time the water gets from the reservoir into the city, 80 percent of it leaks out? DE SAM LAZARO: Non-government groups are trucking potable water from the city’s reservoir in large rubber bladders, installing these on roof tops. Transporting them and finding available rooftops has been difficult. Dr. GILLES: The first goal we’re doing now is providing potable water to maximum of population, and the next stage will be cleaning the wells. DE SAM LAZARO: Preventing disease is half of the public health task. The other is to rebuild demolished health care facilities. This warehouse, spared by the storms, has been converted into an 80-bed temporary hospital, the only one to serve some 200,000 people. Dr. RODNIE SENAT (Gynecologist): Since we set up the field hospital, the first day we had two deliveries, and up until now we’ve delivered 15 babies. 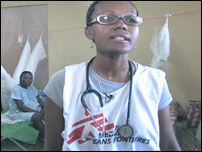 DE SAM LAZARO: Like the hospital itself, Dr. Senat is here temporarily, volunteering on a month’s leave from her private practice in the capital, Port Au Prince. The UN has pledged to build a permanent hospital that can withstand the next hurricane. But for everything from a daily meal to rebuilding homes, indeed to rebuilding a civil society, churches will play a key role. MICHAEL WILSON (Cross International): There is no government for the most part. The infrastructure — you’ve seen the country, you’ve seen it from the air, and so where they’re going to turn is they’re going to turn to their local church. Their local church was here yesterday; their local church is here today, and it’s going to be here tomorrow. DE SAM LAZARO: Wilson works with a Florida-based charity called Cross International. It gathers donations from church campaigns and radio-thons across America, then channels them to local churches here. One local partner is El Shaddai Ministries, which houses growing numbers of children orphaned by the storms. Pastor DONY ST. GERMAIN (El Shaddai Ministries): We started this ministry after Jeanne in 2004, and then we started in 2005 with the building. So we thank God for providing the seed funds so that we could have started this building. So right now we have 250 kids we are ministering here in this facility, and there’s 300 other kids that has been affected by the new storms who are waiting for a place to call home. Mr. WILSON: So will you be bringing them up here? Pastor ST. GERMAIN: Yes. Yes. Pastor ST. GERMAIN: So we provide three meals for them, some snacks, and also at the same time we have a school. They will be able to go to school. DE SAM LAZARO: President Preval has vowed Haiti will build back better than it was before. His country, born out of a slave revolt, plagued by invasions and civil unrest for its first 200 years, has been relatively quiet since 2006, thanks in part to 8,000 UN peacekeepers. Preval, elected in 2006, says peace is the first priority. President PREVAL (through translator): In 2005, 2006, if you’d been here you wouldn’t have been able to go to Gonaives, walk the street. Today we have restored peace to the country. It’s the beginning of the country’s rebuilding. DE SAM LAZARO: But as the international community’s emergency SWAT teams leave, as relief gives way to rebuilding, Michael Wilson worries. Mr. WILSON: It’s the worst thing that you can see in one of these disasters: international community goes home. At some point in time, it becomes a very difficult sell back home, and without that sell you’re not going to have the donors to react. Once it’s out of the news, and right now the news cycle is pretty much focused on politics back home, it’s not big news, it’s not pretty news. But the long-term effect is, you know, we’ll be here on the ground. We’ll be serving with these pastors that are here. They don’t have a ticket to go home. They are home. How can we improve our program or Web site? DE SAM LAZARO: There’s no more compelling metaphor for the long road ahead than the roads here in Gonaives. Almost a month after the last hurricane passed through, they remain mired in a toxic muck. Faith-based organizations will play a key role in keeping international attention on the task that lies ahead. 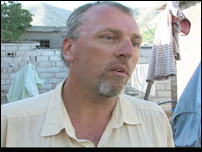 For RELIGION & ETHICS NEWSWEEKLY, this is Fred de Sam Lazaro in Gonaives, Haiti. 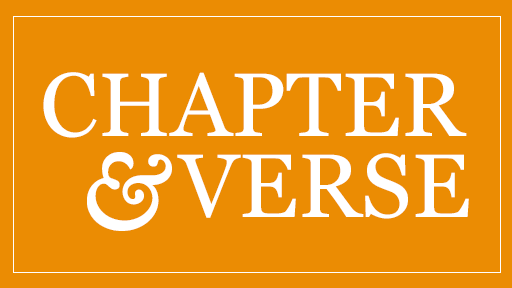 THE USES OF HAITI by Paul Farmer et al.